Crematorium and cemeteries map (PDF 150KB) shows where the crematorium is located. 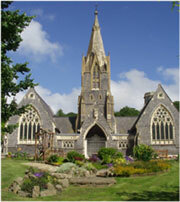 Public transport links are available and the crematorium is approximately a 30 minute walk from Brighton Station. All chapels have free parking nearby, including spaces for disabled badge holders. The grounds are open every day of the year. The North and South Chapels are adjacent to the crematorium building and located approximately quarter of a mile up the drive from the main Lewes Road gates. The Extra-Mural Chapel, which is also used for services sometimes, is in the Extra-Mural Cemetery and cannot be accessed from the main Woodvale gate. There is a separate sign posted gate earlier up the road, opposite the BP petrol station. If you do not know which chapel you require for a service, it is advisable to contact the Woodvale Lodge Office. See a map of the grounds (PDF 430KB). Memorial options such as the Garden of Remembrance, the Hall of Memory and jewellery. Please note that the Downs Crematorium and the Brighton & Preston Cemetery, both located in Brighton, are owned and managed by Dignity Funerals Ltd, a private company, and have no connection with Brighton & Hove City Council. If you think the information available on this web page could be improved, please let us know.